Strategic dominance is a state in game theory which occurs when one strategy that a player can use leads to better outcomes for them than all the other possible strategies that they can use, regardless of which strategies their opponents use. Accordingly, a strategy is a dominant strategy if choosing it leads a player to better outcomes than the other strategies that they can choose. Conversely, a strategy is a dominated strategy if choosing it leads a player to worse outcomes than the other strategies that they can choose. In the following article, you will learn more about strategic dominance. You will start by learning about dominant and dominated strategies, and about strategic dominance in general. Then, you will see how accounting for strategic dominance can help you make more strategic decisions, and how it can help you predict your opponents’ behavior. A dominant strategy is a strategy that is better than all the alternative strategies that a player can pick, regardless of which moves their opponents make. This means that, in a given game, a player’s dominant strategy is the best strategy that they can choose from a strategic perspective, since it’s the one that will lead to the greatest payoff for them. A strategy is strictly dominant if choosing it always gives a better outcome than choosing an alternative strategy, regardless of which moves other players make. A strategy is weakly dominant if choosing it always gives an outcome that is as good as or better than choosing an alternative strategy. You can get $10 now. You can flip a coin, and if the coin lands on heads, then you get $10, but if the coin lands on tails, then you get nothing. Clearly, the dominant strategy in this case is to take the $10 up front, since choosing to flip the coin will get you a result that is either as good as or worse than taking the money up front. This example represents a very simple game, where it’s clear what the dominant strategy is, just so we can clearly illustrate the concept of strategic dominance. Later on, you will see examples of more complex situations, where dominant strategies also play an important role. A dominated strategy is a strategy that is worse than all the alternative strategies that a player can pick, regardless of which moves their opponents make. This means that, in a given game, a player’s dominated strategy is the worst strategy that they can choose from a strategic perspective, since it’s the one that will lead to the worst payoff for them. A strategy is strictly dominated if choosing it always gives a worse outcome than choosing an alternative strategy, regardless of which moves other players make. A strategy is weakly dominated if choosing it always gives an outcome that is as good as or worse than choosing an alternative strategy. Imagine the scenario that we saw earlier, where you can either get $10 now, or you can flip a coin and if the coin lands on heads then you get $10, but if it lands on tails then you get nothing. Clearly, the dominated strategy in this case is to agree to the coin flip, since doing so will give you an outcome that is either as good as or worse than taking the money up front. Once again, this is a highly simplified game, which is used to illustrate the concept of strategic dominance in a clear manner. In the next section, you will see an example of a dominated strategy in a more complex scenario. Consider a situation where two companies, called Startupo and Megacorp, are competing in a new market. This market has one product which is sold in two different versions: the simple consumer version and the complex professional version. Both versions of the products are equally profitable for the company selling them. Most people in the market (80%) are interested in the consumer version, and only a few (20%) are interested in the professional version. Each company can decide whether it wants to sell the consumer version or the professional version of the product. If both companies decide to sell the same type of product, then the two companies have to split the market for that product. Otherwise, each company has the full consumer or professional market for itself. Both companies enter the consumer market. This means that the companies split the consumer market (which accounts for 80% of the total market share), and that each company therefore gets 40% of the total market share. Both companies enter the professional market. This means that the companies split the professional market (which accounts for 20% of the total market share), and that each company therefore gets 10% of the total market share. Startupo enters the consumer market, and Megacorp enters the professional market. This means that Startupo gets the full consumer market (80% of the total market share), and Megacorp gets the full professional market (20% of the total market share). Megacorp enters the consumer market, and Startupo enters the professional market. This means that Megacorp gets the full consumer market (80% of the total market share), and Startupo gets the full professional market (20% of the total market share). Based on this, if a company chooses to enter the consumer market, they know that they will get either 40% or 80% of the total market share. Conversely, if a company chooses to enter the professional market, they know that they will get either 10% or 20% of the total market share. Accordingly, for both companies, the dominant strategy in this scenario is to enter the consumer market, since regardless of which move the other company makes, they will end up getting a bigger portion of the market share this way. Conversely, for both companies, the dominated strategy is to enter the professional market, since regardless of which move the other company makes, they will end up getting a smaller portion of the market share this way. Note that this scenario can become more complex by adding more variables which frequently appear in real life, such as additional players, additional products, and different profitability margins for different markets. However, though these additional factors make the computations a bit more complex, the fundamental idea behind dominant and dominated strategies remains exactly the same. In scenarios where there is only one player, there can still be dominant and dominated strategies. Wait for the light at this crosswalk to turn green. Keep going until you reach the next crosswalk, and then cross there. Given that your goal is to minimize the amount of time spent waiting at the crosswalk, the dominant strategy in this case is to keep going until you reach the next sidewalk. You will reach the second crosswalk just as the light turns red, in which case you will have to wait the same length of time that you would have had to wait at the first crosswalk, which represents an outcome that is equal to the outcome that you would have gotten if you chose to wait at the first crosswalk. You will reach the second crosswalk while the light is already red, in which case you will have to wait for less time than you would have had to wait at the first crosswalk, which represents an outcome that is better than the outcome that you would have gotten if you chose to wait at the first crosswalk. You will reach the second crosswalk while the light is green, in which case you won’t have to wait at all, which also represents an outcome that is better than the outcome that you would have gotten if you chose to wait at the first crosswalk. Since the strategy of going for the next crosswalk leads to an outcome that is equal to or better than the outcome of waiting at the current crosswalk, it’s the (weakly) dominant strategy in this case. Note that, in this game, though there is only one player, the concept of “luck”, in the form of whether or not the next light will be green or red, can be viewed as representing a second player. However, the concept of strategic dominance can occur in even simpler conditions, where there is no element of luck. For example, consider a situation where you need to choose between buying one of two identical products, with the only difference between the products being that one costs $5, and the other costs $10. If your goal is to minimize the amount of money you spend, then clearly buying the cheaper product is the dominant strategy in this case. There are situations where none of the possible strategies are dominant or dominated. A strategy that is neither dominant nor dominated is referred to as an intransitive strategy, and a game with no strategic dominance is referred to as a non-transitive game. This represents the fact that there is no transitivity, meaning that just because strategy A is better than strategy B, and strategy B is better than strategy C, that doesn’t mean that strategy A is better than strategy C.
Rock wins against scissors, loses against paper, and draws against rock. Paper wins against rock, loses against scissors, and draws against paper. Scissors wins against paper, loses against rock, and draws against scissors. In this case, there is a preference loop with regards to which strategy leads to which outcome, since each strategy is preferable, to an equal degree, in different situations. Accordingly, none of the strategies is dominant over the other strategies, and the game is said to have no strategic dominance. Accounting for strategic dominance can help you make better decisions. 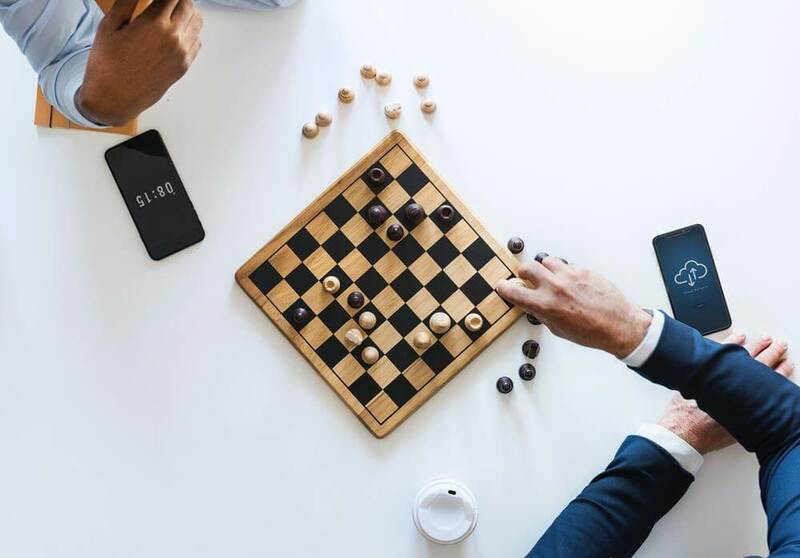 In order to take strategic dominance into account, you should first assess the situation that you’re in, and take into account all the possible moves that you and your opponents can make, as well as the outcomes of those moves, and the favorability of each outcome. Once you have mapped the full game tree, and ranked your outcomes in order of favorability, you can move on to identify your dominant and dominated strategies, using the criteria that we saw above. Then, if you have a dominant strategy, use it. Otherwise, try to identify any dominated strategies that you have, and rule them out. If strategy A is better than both strategy B and strategy C, that means that strategy A is a dominant strategy, and that you should therefore use it. If strategy A is equal to strategy B, but both are better than strategy C, that means that strategy C is a dominated strategy, and that you should therefore rule it out. In more complex situations, you might choose to repeatedly rule out your dominated strategies, in a process called iterated elimination of dominated strategies. Eventually, doing this will leave you with either a single dominant strategy to use, or with a number of equally-viable strategies that you can choose from. If all these strategies lead to outcomes that are perfectly equal to one another, one way to choose between them is to add a secondary variable, which will allow you to enhance the way you rank the favorability of the different outcomes. For example, let’s say you’re trying to decide which laptop to buy, out of five possible options. At first, you might use price and reviews as the two most important factors to consider, which will allow you to filter out most of the options, until you end up with two possible alternatives to choose from, that are ranked equally based on these criteria. At this stage, you can add an additional variable, such as warranty, that wasn’t important enough to take into consideration during the initial stages of your decision, but which you can now take into account in order to choose between these otherwise equal options. In the rare situation where all strategies lead to outcomes that are truly equal, and there is absolutely no way for you to discern which one is better, you can simply pick one at random. In the case of games with multiple players, doing this has the added advantage of helping you make moves that are difficult for your opponents to predict. You should assume that your opponents will use their dominant strategies. You should assume that your opponents will avoid their dominated strategies. They know something that you don’t. They have different goals than you expect them to. They’re acting irrationally, and not doing what’s best for them from a strategic perspective. As such, the better you can estimate your opponents’ knowledge and preferences, and the more rational your opponents are, the more likely they are to act in a way that you expect them to, when it comes to strategic dominance. Furthermore, the more strongly a certain strategy is dominant over others, the more confident you can be that an opponent will use it, and the more strongly a certain strategy is dominated by others, the more confident you can be that an opponent will avoid it. The concept of the Nash equilibrium is one that is often mentioned in conjunction with strategic dominance. Though it’s not crucial to understand what a Nash equilibrium is in order to understand what dominant and dominated strategies are, this concept can still be interesting to learn about, and it has some useful practical applications, that relate to strategic dominance. A Nash equilibrium is a situation in a game with multiple players, where no player stands to gain anything by changing their own strategy while other players keep their strategies unchanged. For example, in the example we saw earlier, where two companies can choose whether to enter the consumer market (80% of the total market share) or the professional market (20% of the total market share), the Nash equilibrium is the situation where each of the companies gets a 40% share of the total market by investing in the consumer version of the product, since neither of them will be able to increase their market share by switching to the professional market. There can be more than one possible Nash equilibrium in a given game, and Nash equilibria are generally self-enforcing, since once players reach them, they have no incentive to change their strategy. There are several important connections between strategic dominance and Nash equilibria. First, if a player has a strictly dominant strategy, then that player is going to use that strategy in each of the possible Nash equilibria in the game, since that’s the best strategy that the player can pick. Furthermore, if each player in the game has a strictly dominant strategy, then there is only one unique Nash equilibrium in the game, since all players are simply going to pick their strictly dominant strategy when deciding how to act. In addition, if a player has a strictly dominated strategy, they cannot use it as part of a Nash equilibrium, since they will always profit by using a different strategy. However, if a player has a weakly dominated, that strategy can sometimes be a part of a Nash equilibrium. For example, in a situation where two players must agree to something in order to get the best outcome, a state where both players disagree can be a Nash equilibrium, since neither player benefits from switching their strategy (from ‘disagree’ to ‘agree’), unless the other player does the same, despite the fact that both of them will benefit from making the switch (i.e. from agreeing with each other). Though a Nash equilibrium is a situation where no player can benefit from unilaterally changing their strategy, that doesn’t mean that a Nash equilibrium represents the ideal solution to a game. If both prisoners betray each other, they each get 2 years in prison. If both prisoners stay silent, they each get 1 year in prison. If one prisoner betrays the other, and the other stays silent, the one who betrayed gets to go free, while the one who was betrayed gets 3 years in prison. If the first prisoner stays silent, it’s better for the second prisoner to betray them, since this means that the second prisoner gets to go free instead of spending a year in prison. If the first prisoner betrays the second one, it’s better for the second prisoner to betray the first one in return, since this means that the second prisoner will get only 2 years in prison, instead of 3. Here, there is a Nash equilibrium in the state where both players select their weakly dominant strategy of betraying the other person, which ends up causing them both to spend 2 years in prison. In theory, both players could benefit more from choosing to stay silent, which will allow them to spend only 1 year in prison, instead of 2. However, since there is no way for each player to guarantee the honesty of the other player, neither of them will be willing to switch to the ‘stay silent’ strategy, since if they do this alone, they will end up spending 3 years in prison (instead of 2), while the other person will get to walk away free. Note: a related concept to the one illustrated here is that of Pareto efficiency (sometimes referred to as Pareto optimality), which is a state where any changes in strategy will make things worse for at least one player. Nash equilibria should be taken into account when thinking about dominant and dominated strategies, because they can help you predict how people will act, and because they can help you identify situations in which players can reach mutual agreements. As such, if you are doing a strategic analysis of a certain game, try to identify any possible Nash equilibria, and take them into account when predicting how people will act, and when deciding how to act yourself. Strategic dominance is a state in game theory which occurs when one strategy that a player can use leads to better outcomes for them than all the other strategies that they can use, regardless of which moves their opponents make. A strategy is dominant if choosing it leads to better outcomes than other possible strategies, and dominated if choosing it leads to worse outcomes than other possible strategies. If you have a choice between receiving $10 now or tossing a coin and receiving $10 if it lands on heads but nothing if it lands on tails, getting the money upfront is the dominant strategy while flipping the coin is the dominated strategy, since taking the money upfront leads to an outcome that is as good as or better than flipping the coin. When deciding which strategies to use, you should strive to use your dominant strategy and to avoid your dominated strategies, and if necessary, you can iteratively eliminate any dominated strategies that you have, or introduce new criteria in order to choose between several dominant strategies. You can predict your opponents’ moves by generally assuming that they will use their dominant strategies and avoid their dominated strategies, though there some exceptions to this, such as situations where your opponent is acting in an irrational manner, or has different goals that you expect them to. If you found this article interesting and you want to learn more about game theory, take a look at “The Art of Strategy: A Game Theorist’s Guide to Success in Business and Life“. It’s a good read for someone looking to understand basic game theory and how it applies to real-life situations.